The Eco Air DD122FW Desiccant Dehumidifier is different from the majority of home dehumidifiers offered in the marketplace. In recent years a few manufacturers have produced dehumidifiers using desiccant technology for residential use. 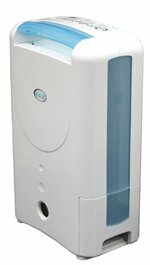 The DD122FW is one such unit and uses a desiccant wheel to capture water vapour from the air. This contrasts with the more typical refrigerant process, found in most home dehumidifiers, which condenses water vapour on to a cold coil. Desiccant dehumidifiers have been available for many years but until recently have been confined to commercial and industrial applications where one, or both, of their two advantages have been needed. Desiccant dehumidifiers can operate in lower ambient temperatures than refrigerant models because they do not suffer from ice formation on a cold coil. Their second advantage is their ability to reduce humidity, both relative and specific, to lower levels than are achievable by their refrigerant cousins. They are also, usually, smaller, lighter, more reliable and quieter than refrigerant units. In residential applications, where conditions are not so extreme as to require these qualities, the other benefits are offset by higher energy consumption and the generally higher unit cost of these appliances. Both unit costs and energy costs have been sufficiently reduced in recent years for desiccant dehumidifiers to have become more attractive for residential use although the costs, particularly energy, are still significantly higher than those of refrigerant equivalents. The Eco Air DD122FW Dehumidifier is not sold in the USA and Canada. If you are here because you need a low temperature dehumidifier that will operate effectively at temperatures below 60°F/16°C please visit our page about dehumidifiers for cold areas for information about the brands and models of dehumidifier which may meet your need. The Eco Air DD122FW uses a slowly turning desiccant wheel, or rotor, to capture water molecules from the air. A large part of the wheel consists of a desiccant material, a material which captures the molecules via a chemical process, known as adsorption (the "d" is correct, it is not a typo). During each rotation of the wheel it passes through a stream of warm air. The heat energy releases the water molecules and so "reactivates" the desiccant, enabling it to capture more water during the next rotation. All desiccant dehumidifiers operate using the same principles but they vary in the way the water removed from the air is disposed of. Commercial and industrial desiccant dehumidifiers, and some residential units, vent the warm, moisture laden air outside the building, via ducting. Some desiccant dehumidifiers for home use collect the moisture and deposit it in a water collection container, just like a refrigerant dehumidifier. The Eco Air DD122FW uses the second method, collection of liquid water, so does not require ducting. Installing ducting is an inconvenience, although it should be stressed that we are talking about an arrangement little different from that required for a heated clothes dryer (tumble-dryer). The disadvantages are three-fold. First, a desiccant dehumidifier using this method of water disposal is limited to operation at temperatures around freezing point, no different from a refrigerant dehumidifier with an efficient "hot gas defrost" system. Second, the warm air used to reactivate the desiccant wheel is discharged into the room, at 10°C to 12°C (18-22°F) warmer than the intake air. Third, the water has to be emptied from the water collection container. The DD122FW is configured for continuous drainage but the inconvenience of this arrangement offsets the advantage of avoiding the installation of ducting. These disadvantages may be considered to cancel out some of the apparent benefits of this unit as a home dehumidifier. Hot gas defrost is rarely necessary in a dehumidifier used solely in living areas of the home. Refrigerant dehumidifiers with this feature tend to be more expensive to buy, but so, on the whole, are desiccant machines. Raising the temperature of the room will be of benefit in cold weather and if the unit is being used to accelerate indoor laundry drying in winter this may be advantage. If the dehumidifier is being used to make living spaces more comfortable for their occupants it will be used mainly in warm weather when raising the room temperature is not desirable. A desiccant dehumidifier will use more energy to operate so it should be asked if any of the other advantages justify the additional expense. The Eco Air DD122FW is a compact dehumidifier, an undoubted advantage of the use of desiccant technology. The exterior dimensions are 35.0 x 22.9cm (foot-print) and 48.5cm (height). A second advantage is its light weight of only 6Kg, making it a truly portable dehumidifier. The water extraction rate of the Eco Air DD122FW is 7 litres per day at 20°C and 60% relative humidity. It is difficult to compare this rate with that given for an equivalent refrigerant dehumidifier. Water extraction rates for refrigerant dehumidifiers decline dramatically as temperature and/or relative humidity levels fall. It is probably fair to say that a refrigerant unit rated at 20 litres per day (usually at 30°C and at least 80%RH) would be extracting no more water at 20°/60% and may be considered comparably effective. Desiccant dehumidifiers make less noise than refrigerant dehumidifiers and the quoted noise output for this unit is 34dB. This is a relatively quiet unit but it has two fan speeds and will be noticeably louder at the higher speed. Much is made in sales literature of the noise reduction allowed by the absence of a compressor (an essential component of a refrigerant dehumidifier). The principal source of noise in a dehumidifier comes from the fan so the reduction in noise is real but probably less than you might expect. The Eco Air DD122FW is offered in two versions. The "Simple" is the no frills version. to which all previous comments, and data in the table, apply. The "Classic" is the more highly featured version and includes electronic controls, a timer, an ioniser, adjustable louvres (to direct air flow) and a more sophisticated humidistat control. The additional features come, of course, at a higher price. The weight that is attached to the various strengths and weaknesses of the Eco Air DD122FW is a matter of individual preference. On one point, however, this dehumidifier has an unmatched advantage over a refrigerant model. It is capable of reducing relative humidity to a level lower than a typical refrigerant dehumidifier. In a cool environment where an item or items of high value, wholly or partially constructed from steel, are stored the ability to maintain relative humidity at around 40% will be crucial if corrosion is to be avoided. Not only will this dehumidifier achieve that degree of control but its output of warm air becomes a positive advantage as raising temperature reduces relative humidity and, therefore, the risk of condensation. If you store a classic car, valuable machinery and tools in a garage, for example, the Eco Air DD122FW would be a worthy candidate on your short-list of suitable dehumidifiers.